The 44th seal of the Roboplastic Apocalypse snaps, crackles, and pops with great roboplastilogical significance as I am joined by John of Toyfinity.com and Sean of "I BOUGHT TILTOR FOR 25 BUCKS!" Yes an event of great Zetonian importance has occurred in the realm of Robo Force action figure robot collecting and like that video of the Hindenberg disaster and every other historic event that meant a lot but was recorded in really crappy quality, you won't want to miss it! What's it like to buy the only known example of an action figure that's never been seen in 27 years? Which one of us has a bedroom with Robo Force bedsheets? How is a Chuck E. Cheese in 1985 the closest the world has ever been to a Robo Force convention? Find out all this and more in this "WITHOUT PIZZA, BAD STAR WARS MERCHANDISE AND BUY-IT-NOW WE WOULDN'T BE HERE" edition of the podcastalypse! Okay this one is about an hour long and the middle twenty minutes are ear splitting horror. Actually the first and last twenty minutes ain't that great either. But I really hate when podcasters get all meta and apologize about audio quality issues because I am half deaf I can never figure out what they're talking about anyways. So I figured I won't apologize but as a token of my appreciation to you, my fellow Macrocranians, I will provide a transcript of the show that may or may not be entirely correct (but you get the idea). Thanks for listening (or not listening and just reading what I wrote out)! ...and all you other roboplastic historians. Welcome to another ROBOFORCEtastic Podcastalypse! Yes, hello once again my fellow Macrocranians, it is I, the Nostrodomatron of the Roboplastic Apocalypse, the battle hardened ruler of the Kingdom of Macrocrania...and toy robots enthusiast, Steve. And this is a special, super special, super awesome edition of the Roboplastic Apocalypse... Podcastalypse... whatever it is I call it. Because something truly momentous has happened within the past week or so of tremendous importance to Robo Force fans everywhere. And speaking of Robo Force fans everywhere, I think I have every single Robo Force fan everywhere on the show tonight. Steve: [laughs] I have with me John of Toyfinity.com and FansofPheyden.blogspot.com. Hello, John. Thank you for joining me on this night, on this big-deal-to-me night. I really appreciate it because of your knowledge and everything you've done for the sake of toy robots and just toys in general. It's really appreciated that you're with me on this episode. Steve: And the second person, the second of this incredible guest lineup tonight in the world of Robo Force fandom, is a man by the name of Sean who has done something incredible, unheard of, unprecedented, unimaginable not even a few weeks ago. But we'll get to that later. First and foremost, Sean is an incredible Robo Force collector. And why do I say this? Well, anybody can have a Robo Force collection. It doesn't take that much to stay on ebay all day and grab the however...how many Robo Forcers are there? Like 10 or so? Steve: Okay. Yeah, it doesn't take a lot to just stay on eBay and grab ten Robo Force figures and there's a collection. But you know, it takes a certain special kind of guy to deck out his bedroom in Robo Force bedsheets and put Robo Force puzzle posters on the wall and even build, in the same sort of level of fan dedication as R2-D2 builders, even build a Robo Force-ish robot in their house. This is just far and above one of the most impressive Robo Force fans I've ever heard of in my life. And beyond anything that you have, Sean, you are truly, truly a Robo Force fanatic, a true Zetonian amongst Zetonains and I would like to thank you so much for gracing me with your presence tonight and coming to me after making the enormous discovery that we'll get into a little bit later. Sean: No problem. It's my pleasure. I just want to clarify-those bedsheets and those posters and all are in my son's room, not in my bedroom. Sean: It's not my bedsheets. Steve: Sean, you've been a pretty die-hard Robo Force fan. It's very obvious from the pictures you've sent me of your collection that you live your life the Robo Force way, or have this Robo Force aspect of your fandom. So what got you started on all of this? Sean: With Robo Force, here's the deal-the thing that I always liked about Robo Force. It's basically that the toyline pretty much transcended all toylines. When I was a kid, everybody had a good amount of action figures-Star Wars, GI Joe, He-Man, Thundercats, whatever it might be. But they were all over the place in terms of scale. So M.A.S.K. figures didn't really fit inside G.I. Joe vehicles, and G.I. Joe didn't work with Star Wars. Steve: Yeah, I know what you mean. It's kind of the same here. John can I ask the same of you? Do you remember what got you into Robo Force or interested in it, or got you to be a fan of it? John: Robo Force was one of those lines that we know from your excellent archive of ads was massively clearanced at stores like Kiddie City. And I think that in the early era of being a kid, you know, around ten years old and not really having too much money to spend on things, you can only buy so many G.I. Joes in one trip. We wound up with a couple Robo Force figures-my brother and myself-I know one of them was Blazer. And I think we also got a Maxx Steele from the flea market. They're of a scale, similar to what Sean said, where using them with G.I. Joes they were a massive force that could either help Joe or destroy Joe. And we really mixed our toylines together so when we played action figures there'd be a Robo Force figure there and Jawas and G.I. Joes and Transformers and a couple of Lego guys. You know, we just tried to create a complete world of action figures. So it was one of those lines that when I had the ability to buy it again as an adult and really appreciate the box art and the quippiness that's on the boxes and the ridiculous Blazer playing a saxophone to give him personality-it's just a fun line that you don't have to spend ten million dollars on trying to complete and usually you can get them boxed for a pretty good price. Steve: Yeah, I see what you mean. The collectability of it is still there and it's also nice that they don't cost an arm and a leg and it is so overlooked I guess in terms of popularity. There's not a lot of fans out there on ebay competing with you over Robo Force toys. John: Surprisingly that's not true, Steve. Actually it took me over a year to get the last four figures I didn't have, which was Cruel, Vulgar, S.O.T.A. and uh, who was the fourth one? They really bid me up on ebay where I would try to get them for under 30 bucks and somebody would always just take it over the top. Steve: So your limitation was how much you were willing to pay but not necessarily availability? They're out there? John: I find that those three-my mistake it was those three (that took a year to get)-they come up less. You know, S.O.T.A., for whatever reason when he would come up (was) always 40 dollars. Sean: Yeah, I was gonna say I kinda agree with that. I think S.O.T.A. 's maybe the most desirable one or the toughest one and I think when they come up loose the reason that Vulgar tends to sell high is that nose piece that he has is always missing. Almost the only way to get that is to buy one in the box because it did detach. And S.O.T.A. has a satellite dish and I think people that are after the accessories for these, which tend to be harder to find than the actual figures, in order to buy them they need to buy them in the box, they've never been opened. And then they're willing to pay. You see this in a lot of toylines where at times the weapon that the figure came with actually outsells or is worth more than the figure itself and it's kind of frustrating, especially if you're trying to hunt that down, that one piece. John: Right. And I just remembered..the fourth figure that I actually couldn't get for a decent price was Maxx himself. John: Because obviously people want Maxx. Something that I know from the Ideal catalog and my Rocks & Bugs & Things quest which took a few years back in the early 2000s, was that they-a lot of times they would ship the assortments good guys and bad guys. So here in the Philadelphia area where I grew up, we never saw roughly half of the Rocks & Bugs & Things figures at all. I didn't know if they were actually released or not until adulthood and ebay. Sean: Right, right. Let's just go back to the whole clearance thing. One of the reasons I had Robo Force figures, and I knew a lot of kids that got them the exact same way-you would have a birthday party and you'd invite these kids from school that you just really didn't know that well. And you'd meet at the bowling alley or one of those Chuck E. Cheese style places and these kids would show up with a gift and I think I got about seven or eight Robo Force figures through inviting (these kids). Because these things were like perennial clearance items. Sean: We had a store here called McCrory's. And I remember going to McCrory's in the nineties before they went out of business. And they would still (have Robo Force). They were a dollar. And I remember seeing them on the shelf. It was funny, though, because it was all Maxx and Hun-Dred, which were the two popular figures from the line. It was Maxx and Hun-Dreds over and over again. But you're talking about six or seven years later after the toyline died. You could have still bought these things for like 99 cents right off the shelf. John: We had, at our local Toys Я Us, into the mid-nineties Secret Wars Kang with glider. John: Hundreds of them. Hundreds. Sean: Yeah, one of the clearance toys out of legends is this Mego toy from the 70s. It was a playset-"Aqua Man and the Shark". It was clearanced for years. They were pegwarmers and shelfwarmers forever. And you try to find one of those nowadays and one in the box would probably run you a couple grand. You just never know what's gonna end up being valuable.I have a friend who I remember when we were kids, we went to KayBee Toy Stores and there were Power of the Force Star Wars figures two for a dollar. We each had to have one. Could you imagine if you had that opportunity today, considering what a Stormtrooper sells for or a Han in Carbonite, and you had to pick one of these figures? John: Yeah, that never stopped actually, because in the nineties when they had the Batman: Animated Series from Kenner, the Penguin sold like crap. And they blew 'em out at Toys Я Us. And then like two years later that figure was like, a hundred dollars mint on card. Sean: Yeah, the Penguin was a choking hazard. He got pulled off the shelves because his umbrella was a choking hazard for kids. The Man-Bat was another one. I remember going into Toys Я Us and they would have just The Animated Series Man-Bats, an entire wall of them. Just 300 figures of Man-Bats. Three bucks a piece, two bucks a piece or whatever.And then a couple years later you'd look online when eBay was like the wild wild west and you'd see somebody bidding up to $300 on this figure and you'd say, Wait, What? Why would you..? That's stupid! I've got five of them sitting downstairs! And then of course, everything kind of balances out over time. Now I don't think you could get three dollars for Man-Bat at all. John: Leatherhead from Ninja Turtles was another one. Sean: Yes, you go through these toylines and I guess unfortunately for Robo Force they never really had that. I never had a difficult time getting any of these. I've probably done something that would make collectors cringe, I guess. One of the things that got me back into Robo Force after years was having a kid. He and I do pretty much everything together. I'm a single father with him so it's just me and him all the time. So the robot thing, I kind of built that for him. We watch all these old movies that he probably wouldn't be exposed to otherwise. It's kind of almost like for me, it's kind of a weird second childhood you know what I mean? I remember doing all these things, building models when I was a kid. So I'm trying to do those same experiences with him and at the same time I think it's cool for me. When we get a new cartoon series that I haven't seen in years like The Real Ghostbusters cartoon. When that came out on DVD I bought the box set. We sat there and we watched every single episode from start to finish until they got unwatchable. Because when it becomes Slimer and the Real Ghostbusters it's not even good anymore. You know. For me, what kind of recreated the interest for this was I started collecting. I guess when I was younger I was into the Star Wars thing. This is before any of the rerelease stuff came out or any of the prequels. It was a cool thing because it was low key, if you can imagine Star Wars being low key. I'm talking about 1992, 1993. Sean: Yeah, yeah, and then all of a sudden it just got to be this...okay it started out cool...okay they're gonna rerelease the movies, that's awesome! They're gonna rerelease the toyline, that's awesome! And now as far as I'm concerned it's gotten to the point where they've killed the goose that laid the golden egg. There's too much. There's too much. It's this overkill everywhere you turn it's just..And it's not good. It's like the band that keeps playing 20 years past their prime. They haven't had a hit since 1986 but they're still going on tour this summer. To me that's kind of what Star Wars has become. Sean: Yeah, yeah, yeah! The Bend-Em's, right. Steve: ...I just thought it was the second coming. Nowadays I wouldn't give that a second look. Sean: Yeah, it's just overkill. I think they do that a lot with...I'm seeing that now with..I mean, one of the reasons I gravitate towards the Mego figures is because that was like the first superhero line to come out. Where today there's like 50 different Batman. Brave and the Bold, Batman: Beyond, The Batman, Batman:Animated, Batman. You have your choice to pick twenty or thirty different Batman figures you can choose from. And you only need one. It's kind of crazy. So for me after the whole Star Wars thing kind of slowed down. I looked towards toys that were big stories pre-Star Wars. And I started getting into the Matt Mason and the Colorform Aliens. Sean:...but he's probably the coolest one in the line. He's also the most expensive. I found him at a flea market for fifty cents. Steve: Your luck is unbelievable. Sean: Sometimes it really is. And it was the one that I needed. And then I got into the Sea Devils, which were like Matt Mason. There's only four figures, but try to find the shark and Kretor and Zark. Sean: They'll both run you like 500 bucks. And then you gotta find condition, and oh my god it gets ridiculous. So that formed an interest in the Zeroids. I don't know if you guys are familiar with Zeroids? It's a robot line made by Ideal. So Robo Force is actually the descendants of the Zeroids. Steve: Do you really think so? I kind of got that impression. I kind of felt that maybe there was some sort of house style there at Ideal. They're so similar in some respects. Like having the grandparents over! Sean: Yeah, I think there is. They've got weird features. I mean, they light up. The Zeroids light up, roll on their own. It's just Robo Force figures. I think the design of Robo Force figures-I'm not a Doctor Who fan at all but I'm familiar with the show and all that enough to see the obvious similarities between the robots in Doctor Who (the Daleks) and the Robo Force robots. It's kind of obvious. Ideal made the Zeroids and then I glance at the Zeroids and then I'm like, you know what? These Robo Force figures are just kind of sitting there and I can just easily get these. I was looking for robot figures for my son to play with that were actual robots and not something stupid. I mean, nowadays you need like a PhD to make a Transformer into a car. And it'll give you a good hour sometimes to figure it out. I mean they come with ratings like, "This is a level 1 Transformer". You can't...there's no fun in that. Steve: It is quite a gimmick. My son loves the Robo Forcers. It's kind of weird because that suction cup base gets him playing with the things far longer than he's played with any Transformer. Sean: I was a weird kid, too. I didn't exactly like Transformers when they were out. It was the one show in the 80s that I was-I loved GI Joe, I loved Star Wars, I loved M.A.S.K. I played with MASK probably more than any other toyline. He-Man and the Masters of the Universe. The Inhumanoids. I'm looking at my Tendril right now in my living room. But for some reason, Transformers and GoBots, I just didn't care for them. They were just-I don't know. And most of the people you talk to, that's the favorite toyline ever. So it's kind of weird. Steve: Yeah, Robo Force is probably not within the top five of most people's favorites, or that they even know in the first place. Steve: Now in terms of collecting now in adulthood, do you collect Robo Force variations or do you take it to a level that most people take Star Wars and stuff? Sean: Honestly, if I come across something that I have not seen before, like I emailed that one picture of the Hun-Dred, right? I don't know if you saw that one, where there's one with red eyes..
Steve: Right, three different Hun-Dreds. Sean: ...there's one with grey eyes, and I have one with grey and red eyes. I didn't notice that at first until I came and got it home and looked at it. It wasn't something I saw and was like, 'Oh my god that's totally different!' It was just one of those things that just happened. Sono, I don't. For me, obviously if it was a figure or something I've never seen before...if it was a drastic paint variation, this figure is supposed to be blue but he's red here or something, yeah, I would definitely not hesitate to purchase something like that. Steve: Just as an aside, is that red paint on the Hun-Dred lasers? On the very tip? Or is it grey paint on a red molded piece of plastic? Sean: Uh, no, it's grey molded with red tips. Painted red tips. You know, you can tell the difference between factory paint and hand paint and this is clearly factory paint. Also, the figure that it's on, you really couldn't tell from the one picture that I sent you, that figure is beat beyond belief. Steve: I saw the sticker was kind of messed up a little, yeah. Sean: That figure, that variation is actually beat. It's well played with, it's basically a mess and the only reason I'm keeping it is because it's different-it's so different from the other two in terms of the eyes. I would be interested in getting "The Robots". I think I told you that in the email, that I think in the U.K. there was a conflict with the logo, the name "Robo Force". I think something else was known as Robo Force. So when the figures came out in the U.K., in Europe, they read-instead of saying Robo Force-they just simply said "ROBOTS" in white block letters. Steve: And they were carded. They came carded. Sean: Yes, and they did come carded. I'm not a big fan of carded, boxed toys. I like things that can be out, held, displayed. I don't really keep most of my stuff boxed and carded. And it's what I was gonna say before-when I bought these Robo Force toys for my son I actually bought them in the box. And for his fourth or fifth birthday I have pictures of him sitting on the floor opening boxes, like demolishing these boxed figures to play with them. Steve: Yeah, I could see how that could drive some people crazy but I am really grateful that you are that way because for purposes of inspection and what happened last Wednesday, it's really valuable to know what exactly was in that thing. Steve: Now we gotta get down to this. We gotta discuss why it is we're all here. And that reason is because Sean came across something on ebay that to this point I didn't even think existed outside of the pages of the 1985 Ideal Toyfair catalog. Could you kind of explain what happened, Sean? How you understood that this thing was rare and what it was and tell me what it was like that first five minutes after you saw it on ebay? Sean: Sure, what happens is when you get into a toyline, you always find there's more to discover. For example, I had M.A.S.K. toys when I was a kid. I never knew there were Split Seconds toys. I never had them because you know, usually people lose interest in toylines. So when I found out about those in the late nineties I was like, Oh wow! There's twelve more vehicles left to find that I don't have, and I got them. And that happens for most toylines. But when I bought all the Robo Force figures I kind of hit the wall. I had the playset, I had the two vehicles, I had the big transport vehicle, I had the ten figures. And I said, okay let me see what else is out there and I come to this website called IMockery which did a whole writeup entirely Robo Force figures. 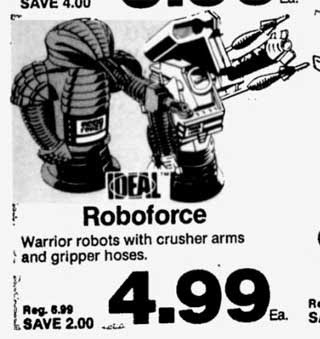 And it's tongue in cheek about Robo Force figures that never were and had never been released. I said, well, you know I'd love to get these. I'd have to have put these on a shelf or something. Duplicates kind of stuff. 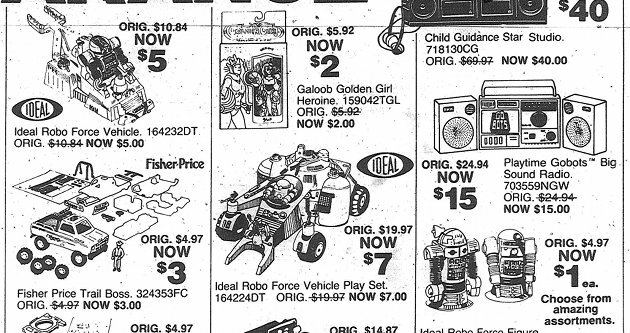 And it was very disappointing to find out that Robo Force was ten figures, three vehicles, one mail away thing. So the cool thing about Robo Force, though, is that there's a lot of random items. We talked about the roller skates and the bedsheets and the card game. I was actually able to produce a few pictures on the wall with all that. So every once in a while I'll check, I'll do an ebay search for Robo Force to see if anything quirky comes up. Because Maxx Steele...for a toyline that didn't have a cartoon, a movie, or even a weekly comic book, they sure got a lot of face time for Maxx Steele on everything. It's very weird. So I typed it in and I'm thinking I guess it was about 11:00 in the morning or whatever and I'm looking at the different listings and it's usually the same three things over and over again. Well, just to backtrack, about three or four months ago there was a listing under Mego figures and it was Star Trek Mego Enterprise with three figures: Kirk, Spock, and McCoy. And I saw the listing and it was a Buy-It-Now of $125 and I kind of chuckled because it's not worth anything near that. And I kept on going. Well, if I had clicked on the auction I would have seen that the guy that the seller thought was Doctor McCoy was actually the figure called Mr. Rock. And Mr. Rock is a very very hard to find Star Trek knockoff figure. He sells for 600 to 1,000 dollars. Sean: Yeah, and I had...I was there and I didn't even look because you know I just went, Oh, overpriced, whatever. And that kind of stung a little bit. I'm happy for the guy that got it. You know, it's a "you snooze you loose" type of thing. So I saw this thing in the box and I saw that it was listed as Cruel and Cruel is purple and maroon and this-it's blue. So I was like, aw, somebody stuffed it-I thought it was a Tomy robot-somebody stuffed a Tomy robot inside of a Robo Force box. 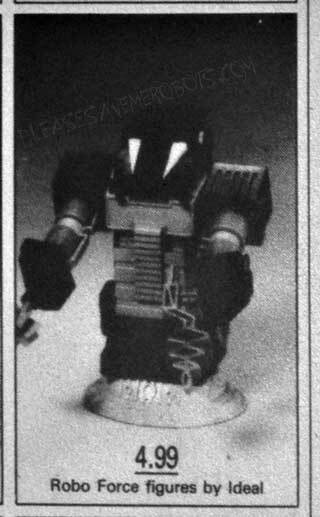 So I clicked on it to see what it was and then staring back at me was this unreleased Robo Force figure from wave 2. Sean: And to describe what happened-it was weird. Because you don't get this reaction from toys but I had difficulty swallowing at first. You know, it was like you're trying to step back from yourself and go, "Oh my god! How is that still sitting there?" Because I think there was something like 5 days, 19 hours left on it, too. Steve: So it may have been a six day auction? Sean: It was a full seven day auction. It had been on for maybe 24 hours, maybe less than 24 hours. It was sitting there. It was just sitting there, sitting for anybody to take so it was just absolute luck that nobody bought it, realized what it was, maybe? I don't know. So yeah, I didn't even read the description after I saw what it was, I was like, "I'm takin' him home!" And I mean I could tell from the description that the person selling it wasn't selling it for what it should have (been sold as). They weren't saying 'This was an unreleased figure that nobody's ever seen before'. Steve: Yeah, they just went with what the box said it was. Sean: They went with the description of the box. They said, 'This is Cruel the Destroyer from 1985, CBS Toys, never removed from the box. You know, here it is.' Then as it happens, they were located about 20 minutes down the road from me. So I contacted them through email I said, 'Listen, I'll be glad to drive down and pick this up in person.' I didn't really want it chilling in the mail and I also didn't...I didn't wanna wait to get it, you know what I mean? Sean: I didn't want it to get lost in the mail and I certainly had visions of somebody seeing this and then contacting them, like, "Oh my god! Don't sell this! ", you know? And I wanted it like, "Don't be sending it!" And she said, "Well come tomorrow and pick it up". And I think I bought it at 11 o'clock in the morning on Wednesday and 11 o'clock in the morning on Thursday I was knocking on their door pickin' it up. Steve: What was the impression you got from them? The kind of people they were, could they be pranksters, jokesters, people who customize things and pass them off? Sean: The people I bought it from? Well that was the first thing. I wanted to get information from them without giving away that I was jumping out of my shoes to go home and look at the thing. So (they were) very nice. Very nice people. One thing I'd done is I "view seller's other auctions", take a look at their completed listings to get a feel for what they were selling. And what they were selling primarily, was like handbags, and things of that (nature). Like, American kitsch. Random stuff, you know, "This property is protected by Smith & Wesson" lawn signs. Stuff like that. Steve: Yeah, I saw that one. Sean: ...which I also bought as well, not that I wanted the box at all. Steve: And nothing weird about that Maxx, right? Sean: No, there was nothing. I just wanted something. I think they were selling it (and) I thought it would be cool to compare the two. Maybe something was weird about it, you never know, that kind of thing. So it did come with a Maxx Steele figure as well. So I did buy both of them. Steve: Yeah I saw Maxx came in a normal 1984 box and then the Cruel/Tiltor came in the later boxes with the shuttle sled offer. Sean: Yes, which would make sense. Maxx, I believe he came in both boxes but you figure a figure like Tiltor would come out in a later release box. So yeah, they were that. Steve: Yeah, and it doesn't have the sticker. Steve: It doesn't have the sticker. The chest sticker is missing from the Broadway Tiltor ad. Sean: The chest sticker's missing? Sean: Oh, that's interesting, too. Well it turns out the Broadway was an exclusive west coast based department store and were eventually bought out by Macy's and turned into Bloomingdale's. Now we had a Bloomingdale's up here and we had an Alexander's, which were two department stores that would've sold these toys. But what I found out is by the time the Broadway had been turned into Bloomingdale's it was already the mid-nineties. So I seriously doubt that the Broadway turned into Bloomingdale's and was selling ten year old robot toys at a discount price. It just didn't (seem) Bloomingdale's was that kind of store, you know what I mean? So they (the ebay sellers) had purchased these figures from an estate sale about two weeks prior to listing it. They had purchased it two weeks ago and honestly I really couldn't press them for information further than that. I couldn't (ask) where were these picken up? I would love to have done that, but when you're buying something...you know, a couple of weeks ago, I don't know if you read the story where the guy bought an Andy Warhol at a garage sale for like five bucks. You don't tell the guy you're buying the Andy Warhol from, "You're selling an Andy Warhol painting". You smile, you nod, you give them the five dollars and you get the hell out of there. And that's kind of what I wanted to do because it's kind of the same thing. You can't say, "Oh by the way, I'm buying an action figure that nobody has ever seen before in the history of toy collecting." You know what I mean? So I asked them-I was conversational-I asked them (for) some information, they said estate sale, and I couldn't say, "Oh yeah, well whose estate sale? Because I really wanna go find out was this guy the president of CBS toys or something." You know what I mean? Steve: Yeah, and well, if they're selling his estate then he's probably not around. Sean: Right, he's dead. Yeah, he's dead. Was he a toy collector, did he work (for Ideal)? It would have been great. And another thing that would have been nice is if the Maxx Steele box had a price sticker on it as well. Neither of those had any price markings at all. That unfortunately is generating a mystery. Steve: Before we go on could I ask just a couple more questions about the figure because you did open it. Steve: Was the tape in any condition to fight you from opening it? That is, did it look like it was the original 26, 27 year old tape? Sean: Yeah, it did. That's one of the things-I actually talked to a friend of mine about this. I said, "I've got this figure. I gotta open it. I gotta check it out. I can't just leave it in the box." And thank god it's not a carded figure. The tape on the side had lost its stick. So the figure could easily be removed. But what was really cool is the figure was taped to the cardboard insert-the white backing that slides into the actual box. Sean: He's still taped to that. Steve: So taped to it, just like a regular production Robo Force figure would be taped to its cardboard backing? Sean: Exactly. 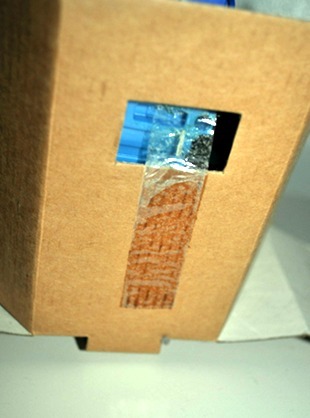 The tape extends from the back of the box, through the hole, right to where the button-the top of the button is to work the thing. And that tape is still there. In fact, that tape has been there for so long, it's actually left a little bit of yellow discoloration. So that figure has been sitting in that box, in that packaging, for years because you can't really replicate the discoloration. You know what I mean? Steve: And there was also discoloration on the weapons bag, too. Sean: Well the weapons bag is still sealed. And the weapons are exclusive to him. It's not like he was just packaged with random weapons. They're the actual weapons you see in the catalog photos. Some zigzag looking thing and a star looking attachment. And that's sealed in the bag as well. That's never been opened. And I did not-I didn't open that nor did I remove the figure from there, from the tape to the figure connecting his parts. So he's-even though I could have slid him out of the box-I didn't want to remove that 30 year old tape that was connecting him from the packaging to the box, or from the packaging to the figure. Steve: Did it come with the instructions? Steve: Yeah, and sometimes it's sufficient whatever's on the side panel of the box to illustrate what the figure does. John: I'm not sure about that. I'm not sure. I'd have to grab my boxes. I think I might have instructions for some of those other ones. Sean: Right, what I'm saying is I don't know. The ones I've had, not all of them, not all ten figures came with instructions. So it's possible that they didn't include, maybe they didn't make enough, but there were no instructions on how to bend this guy at the waist. Like you said, the instructions for the suction cup and the instructions for the gripper arm feature is printed on the side of the box. It did come with a mini-comic, though. Steve: Yeah I was kinda (going to get into that). I actually asked the guy who did the comics if he remembers doing the comics for these other unreleased figures and he said he didn't and that the five he did were the extent of all of them. So there wasn't going to be I guess, a Tiltor comic, or at least not by him anyways. Sean: Right, now from what I could gather, all five of those comic books have been accounted for. None is more difficult to find than the other one, right? Steve: Well, no. Two are tougher to find than the other three-"The Adamantium Heist" and "Trouble in Celestia" I think it's called? One of 'em is on ebay right now honestly. I've got my eye on that because it would be nice to have a copy. But again, people don't really know what it is and although it's one of the harder to find Robo Force comics, it's not really being bid up like anybody understands what it is in that lot. But it's been very difficult for me to figure out which robots those last two books came with. Sean: Right, now you were saying on the website that there's...see, from my experience they all came-most of the ones that I've ever gotten-all came with the same books. Which is weird. They're all kind of different books. They had five different comic books but most of them come with the one where Maxx is getting shot in the back. He's working at a computer and he's getting shot. What is the name? Assault on the Fortress of Steele. Sean: That seems to be one of the most common ones. This figure was packed with the less common, but not as rare as the other two, "Showdown in Space". Steve: Yeah, with Wrecker and Cruel I think? Fighting each other? Sean: Right. Yeah. So that was in there as well. Steve: I don't know if you've looked at it this hard but does it have a copyright stamping on it anywhere? Sean: No. I'm telling you, I looked over this figure very, very carefully. There is no copyright information stamped on him at all, which is kind of interesting considering that almost every toyline brands their figures in some way or another with a logo or a date or licensing rights or something like that. Steve: Other Robo Forcers would have something. Sean: Yeah, it's kind of weird. You know, it's possible that this figure could actually be the one in the photograph of the Ideal catalog. I mean, the chances of that you gotta admit are pretty astronomical. Steve: Well, I don't know. I was talking to John about it and it seemed to me that the base of the figure that you have does not match with the base that was used in the '85 catalog. Sean: The base of it? Steve: The base is different. The base (on Tiltor) in the '85 catalog was just a regular Robo Force base. Well actually I think there were two styles of Robo Force base that were used in the '84 figures. And it's got one of the more commonly used bases from the 1984 line. Yet the one that you have has a special base that's unique unto it that I only ever saw, again, in that Broadway ad. Sean: ...rings or something. I guess they were like plastic dishes. Looked like petri dishes. And they would insert into the base and they would do nothing. They would serve no other purpose than package. They would be packed and then they would be discarded afterwards. And the figure that I have-the base doesn't fit. That little plastic ring doesn't insert properly into the base of the figure. In other words, the base on the Tiltor figure is too shallow. Sean: Yet he was packaged with that. And that's kind of unusual. I'm looking at that catalog right now and yeah, I can see what you mean about the base being...it's a different base. John: I have a theory on that. Steve: That figure also doesn't have the crusher arm mechanism arm straps-the one in the catalog-and yours is fully decked out with the arm strips to make it crush. Sean: Yeah, that's also kind of interesting. I'm looking at the Robo Force...the figure that I have and he's got the arm straps. John: The arm straps on the catalog are actually red. Sean: I was just gonna say that. I think that the catalog one on him might be red because there's no way that figure would be able to raise its arm straight without having that slinky arm flop down. Sean: So I think the figure that I have has the standard grey arm straps. It's actually cooler than what's in the photographs there because there's contrast there. It's blue arms or it's blue shoulders with the red slinky arms, black hands, and then to contrast that is the grey arm straps. Steve: Now John, you were going to say about the base? John: Uh, no...I mean you can clearly see in the catalog picture that the base that's on him matches the bases on the other guys. 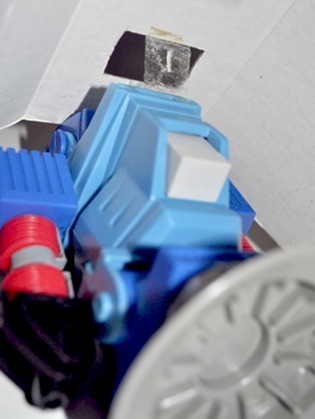 Now, from the picture that was on the ebay listing, it looks like Tiltor's head would be hitting that plastic on the top. Was that the case when you opened it, Sean? Sean: Tiltor's head would be hitting the plastic? Sean: You know what? Yeah, I thought that, too. Like he'd....you know what it is? It's he doesn't fit in the box right because that base is so shallow. John: He wouldn't fit in a standard box. Sean: Yeah, like if you look at the Robo Force robots, they're all made the same way, with the...I mean, they're all round cylinder boxy type robots, yet there's one-I think his name is Reaper? Sean: The one that looked like an alligator. He and Tiltor are rectangular. So I see what you're saying. If they put those regular bases on them the figure would have been too tall. John: And a clue to that is in the assortments. If they were going to be sold, if they had made it to stores with the previously released guys, they would have to be in the same sized boxes. Sean: Right, yes, they would have been. That's a pretty good observation, there, because I guess they shrunk the base down because the base on this figure is totally exclusive. In other words, in shrinking the base down, what happens is that little plastic ring that's supposed to hold the figure in place into the packaging-doesn't fit. So the figure slides around and what happened is this figure inside this box, like, tilted. I guess that's what he's supposed to do. He tilted to one side so in the auction picture he's actually in the box crooked, which is why I thought immediately that he was put in the wrong box, you know what I'm saying? Sean: But it turns out that-I'm telling you, I went over this thing with a fine toothed comb, and this is the packaging he left the factory in. It's not like somebody just stuck him into the wrong box. John: Well I have a theory on that too, now, but we'll get there. Steve: Well I guess we might as well go there now because ultimately the bottom line here is, and part of the reason John was the first person I thought of, was he and I have sort of diametrically opposed viewpoints on what exactly happened with the 1985 Robo Force line. I tend to believe there's enough circumstantial evidence to indicate that they did see release in some form on some level. But I've been (poring) over that on my blog. John of course believes the lack of evidence indicates that these were not released. And honestly after going over all the details as we've discussed them, from my side, my pro-"these guys came out at some point" (stance), this really isn't the smoking gun I was hoping for. Sean: Yeah, I read that theory and here's the weird thing about that theory. It's like, not only have these figures never been found before, but you have to figure like what I explained before how so many people got the Robo Force toys-clearance, parties. They were bought for people that didn't know the person they were buying them for that well. Nobody has ever come forward in 30 years and said, "Hey wait! I had that figure when I was a kid! I had Tiltor!" or "I had Opticon! I remember playing with that figure when I was 8 years old and my mom threw him away." There's never been anybody. And you figure (though) Robo Force is kind of a limited line with a limited fan base, people did have these toys. 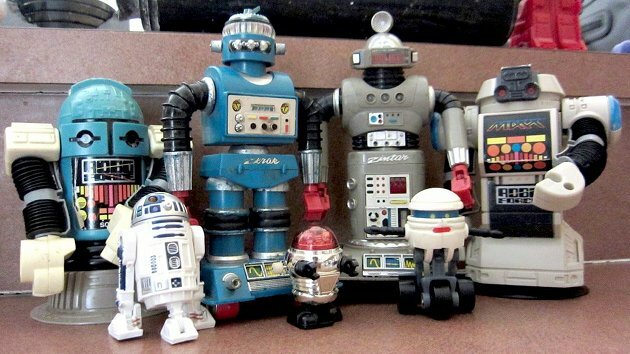 You would figure that some collector out there, whether it be a Transformer collector or a Star Wars collector or whatever kind of collector, would have had one of these toys, you know, gotten in their travels and had a vivid memory. "Hey I had that figure in 1985! I had Ripper and I remember doing this with him" or something. And nobody has ever, no collector has ever said that they happen to have a memory of these toys. Steve: Yeah, that's true. You're right. Okay, so bottom line, guys. What is it? What do you think this is? Sean: ...three from wave 2. So that's kind of interesting. I've talked to a couple of my friends about this and we've come up with a few theories of what this could be. So I'll give you a couple and you can dispute or agree with them. I'm not saying what is right or what isn't. The first theory that I thought of was that this could be a prototype testshot figure. But what John just said-the base being different-I think that could be ruled out because a prototype or a testshot would have the base in the photo. Sean: The other thing that this could be is a salesman's sample where Ideal would send these out to stores for potential buyers to say, "Here's our product". In my expereince those kinds of figures are usually marked 'salesman's sample' somewhere, or 'promotional' so that person that had them could not resell them. You understand what I'm saying? Sean: So you couldn't just turn around and sell them. So there's that. It could also be somebody took it home. Like I said, being that it's New Jersey, this could have been just taken home from the factory. Persons from the shipping plant (saying), "Hey I gotta have this figure here." Steve: It looks factory produced, it doesn't look like there's any 2-up or 1-up or prototype about it. Sean: Exactly, exactly, that's what I'm saying. Here's most likely what I think happened. Ideal might have had a couple of these lying around. Maybe they were shipped out by accident, maybe they were shipped out on purpose. But why? If the line is dead, why bother? Somehow-like I said, if there was a price tag on the box that's the way to prove that this had been purchased somewhere. But somehow, some way, it got out. I don't think it's a prototype. I don't think it's a test shot or a work up. There's no evidence that there's any kind of like, hand painting on here or anything like that. It's all a factory produced item. The way it's packaged, the way the weapons are in the bag. There's nothing that stands out that says 'hand made' or 'trial and error'. This looks like, to be a finished product. This could have been one of a handful of figures that maybe shipped out in one little [unintelligible] and just through sheer luck survived finders. John: Well Steve really made me think about what this is. Because he examined it to a point and he realized first before I did that the base was different. So I can only...I can lay out some facts and then use what I know about the toy industry to try to come to that same type of conclusion. Because I think you're in the right ballpark. John:...the first scans of these Robo Force figures, as far as I'm aware, came from me. Because I was scanning the entire catalog in for any toyline that was there and that was part of my Rocks & Bugs & Things site and I had another site called Toy Clearing House which was just catalog scans in the early 2000s. When I look at the Rocks & Bugs & Things listings, because I looked at the packaging art the same way that you did, it's not the final packaging art because it's missing the blurbs. There's a figure called Terrorantula and it shows his box art in the picture. Now underneath of where his nametag is on the top part of the box there's supposed to be a little blurb that says he's a "night stalker" or something. I could get the box down from my room downstairs. So what they've included in that catalog is an incomplete packaging picture. What would happen is, these catalogs were prepared at the same time as they're creating the figures. So as you can see in a lot of different catalogs, especially Transformers, sometimes you'll have a figure that's concept Rodimus Prime. You know, he's not the final product that's going to be used but they need to have something to shoot for this catalog that's going to be presented to the Toy Fair buyers. Sean: Right, of course. I remember the He-Man line, Ram-Man on the back of every box had orange legs and every kid wanted the orange legs Ram-Man. And he doesn't exist. He does not exist. Every figure has got green legs but, you know, we all believed there was an orange leg Ram-Man out there somewhere. John: You have someone who works at Ideal that remembers Zeroids or worked on Zeroids. And as you said, you stole a lot of my bits from the earlier parts you've said-the original planet in Zeroids was Planet Zero and then it's Planet Zeton in Robo Force? John: So clearly, it's meant to be, if not a sequel, a continuation of that concept. Sean: You know, or a ripoff. John: It had been 20 years, so it would have been ripe for a comeback. I can imagine them thinking that this is gonna be the big line, you know-G.I. Joe, He-Man, and Robo Force. And then they get blown out of the water by Transformers. And I think the guy who did the comic, Steve, he actually says this in the Toyfare article. John: Another guy that I corresponded with was the copy manager for Ideal during the time period of Rocks & Bugs & Things and Robo Force. I specifically asked him if he had worked on Robo Force, Manglors which is another crazy line that I like from Ideal, and Rocks & Bugs & Things. He had not worked on Robo Force but he had named multiples of the Rocks & Bugs & Things himself. So I have an email from him circa 2001 when I last talked to him. And he's just some guy, you know, this was his job and he really didn't wanna talk about it too much and didn't want his name used online or anything.So what he provided to me at that point, because he was digging through his files, and most of the files he had were from some MacIntosh system that he could no longer run the disks. But he had a copy of what he called the Ideal line art catalog. I was leery to tell Steve about this because I know he's gonna snipe me the next time one comes up. What they used to do in the olden days, the pre-computers, pre-internet, was (in order to) assemble the ads that Steve is archiving, they would send a book with line art drawings to retailers. And they could assemble their own ads depending on the prices. That's why you'll see a lot of the ads for these guys have similar fonts. Sean: Yeah, that just ties in directly to the other ones that you found, the other Robo Force wave 2 figures which exist only in line art. John: Right. That would be correct. Sean: How'd they get a hold of that, though? Steve: I have no idea. I believe at some point they have to have been distributed to the stores, but I'm at a loss. John: Well Steve, let me just get this out. What they did was, similar to what this Toy Fair catalog was printed in advance, this catalog for 1985 has line art for everything in it. John: Everything. Because I sent you the scans one time or I put it on my website. And it has all ten Rocks & Bugs & Things and descriptions for the various things. Why would they go to that trouble to do that? It was just something that they print these catalogs far enough in advance that things that never made it into production could be in those line art catalogs. Sean: Yeah, I see what you're saying. So they just produced line art for everything, not knowing. Okay, we've got concept art (for) 20 figures but only 12 of them are getting released but the line art shows all 20. I got you there. Yes believe it or not, there's more! On an upcoming installment I'll post the rest of our RoboForceTastic conversation!